French Baguette with crispy and golden crust. Nothing beats hot-off-the-oven baguettes to accompany a family meal. 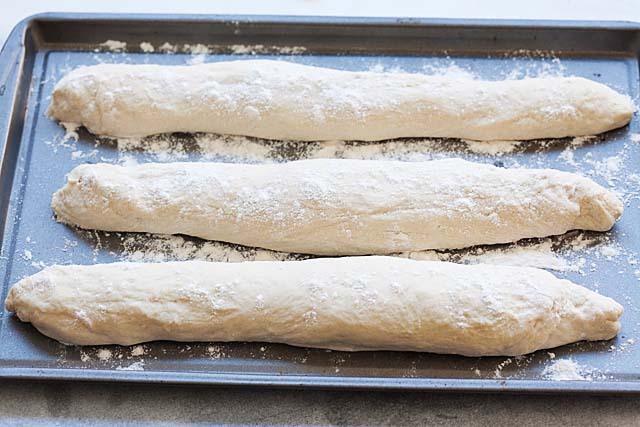 This is a fail-proof baguette recipe! 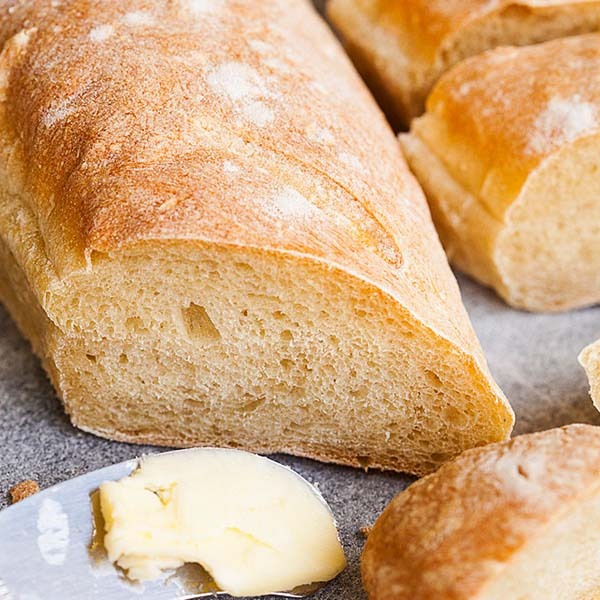 Baguette is a long, narrow loaf of French bread that is hard, crusty and golden-brown on the outside. The crispy crust is what sets French baguettes apart from other similar breads. Baguette is iconic to France; French baguette sandwich is famous the world over. Baguette can be served and eaten as is, to accompany a meal. They are also cut lengthwise and served as a sandwich, such as French-Vietnamese Banh Mi, a popular bread with savory meat and vegetables in Vietnam. To make baguette, you need a mother dough, or Poolish. This is a baguette recipe with Poolish. 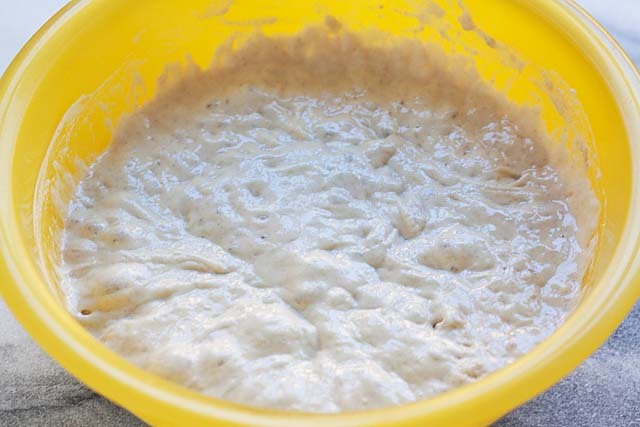 Poolish is also called Pre-ferment, a technique in bread making where a starter dough is made the night before by mixing flour, water and yeast together. The dough is left to ferment overnight, or 12-16 hours until bubbles break out from the surface of the Poolish. The mother dough is then used to create the final dough to make the baguette. Making baguette at home is actually quite easy, and I have step-by-step picture and recipe guide below. 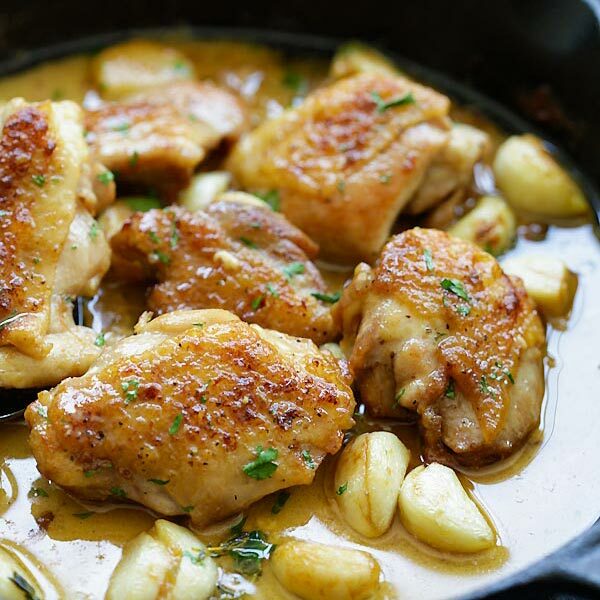 This recipe is fail-proof, fool-proof and the end results are very authentic. It does take a bit of time to make the baguettes, but they are so worth it as the aromas of fresh bread fill and linger in the kitchen. Serve as a side to a meal. Slice the baguettes and spread some butter. 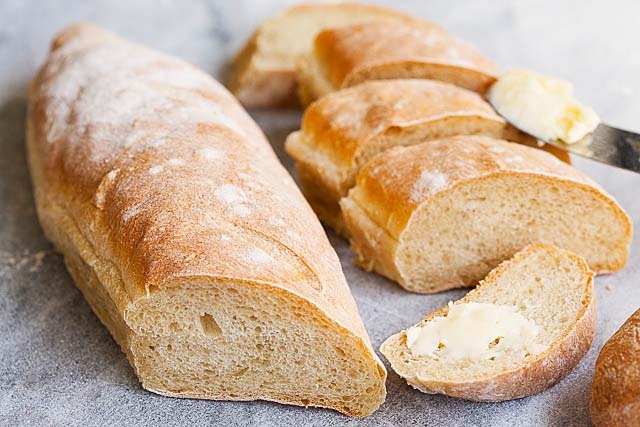 Slice a baguette lengthwise and turn it into a sandwich, such as Garlic bread. Baguette is delicious when it’s sliced to sop up the sauce, such as the dishes below. The night before, dissolve the yeast into the water for the Poolish, then mix in the all-purpose flour. 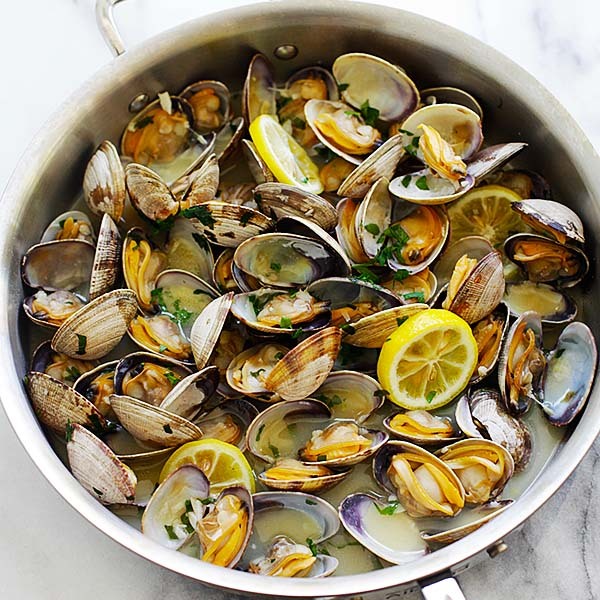 Cover and let it ferment at room temperature for 12-16 hours, or overnight. Once the Poolish has bubbles breaking on top and has started to wrinkle, it's ready. Transfer the Poolish into the bowl of a stand mixer attached with a dough hook. Add water, salt, yeast and all-purpose flour and knead the dough on slow speed for 2-3 minutes. Cover and let it rise for two hours, giving it a stretch-and-fold at the one hour mark. 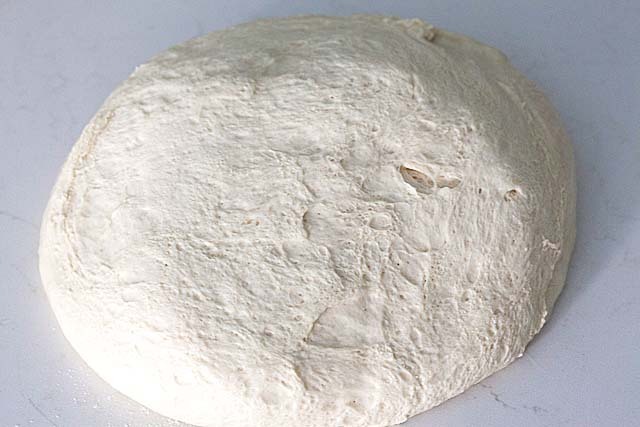 Divide the dough into three equal pieces. Cover and let rest for about 20 minutes. Shape into baguettes about 12 inches logs and cover, letting them rise for about 60 to 90 minutes. Score and bake on a preheated oven at 450F. Place a tray of water below the baguette while baking to create steam in the oven. Bake for about 25 minutes. Remove from oven, let cool and serve. This Poolish Baguette recipe is adapted from The Fresh Loaf. Alas, there is something wrong with the website – when I try to print the recipe for the Baguette, the page reverts to the cover page. Have tried a dozen times, but yesterday and today….. Thank you for the always splendid recipes and news. You do a wonderful job. 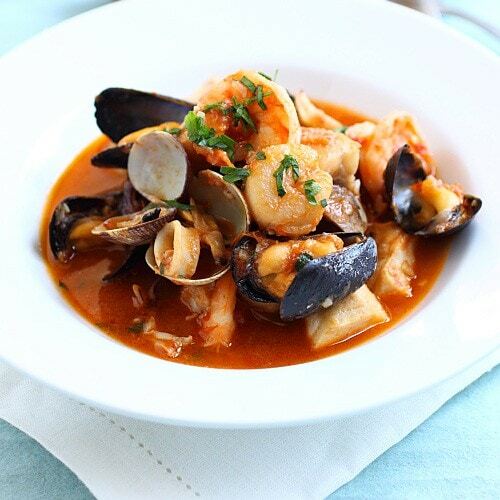 Liz – the recipe is right there, did you scroll down. If you don’t scroll down I can’t help you. The printer button is also there but the plugin is causing problems and we are aware of it. But the recipe is there, it’s not going anywhere whether or not you can print it or not. The recipe is at the bottom of the screen, please scroll down to the pink recipe card. Bee, I tried and throughly enjojed the resulting baguettes but can you suggest how to make the crust less hard ad too solid. I think I followed your recipe t theletter but I may have done something wrong. Do a water bath in the oven. Add a tray of water and place below the baguette when baking. I also found the crust very hard, but otherwise, the baguette was delicious. How much water do you need for the tray of water in the oven, while you’re baking the bread? Just enough water to create steam in a baking tray. Hi! Do you need a mixer with a dough hook or is there another way to do it? You can knead with hands for 20-30 minutes. Can I use the regular yeast or do I need the instant yeast? Please use instant yeast. I can’t guarantee the results if you use regular yeast. Bee your baguette recipe yielded excellent results. I will now experiment with it a bit. Thank you!